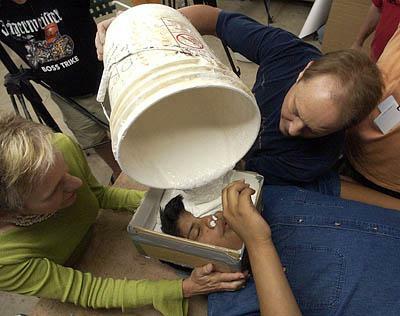 Jonathan Willie, 13, breathes through a straw while artists Dinah Ihle, left, and Kerry Transtrum pour liquefied rubber that will form a mold of his face. After the mold is removed, it will be used to make a glass sculpture that will be one of 15 at the new 900 South TRAX station. Jonathan Willie lay on his back Tuesday in a Salt Lake City warehouse, breathing through a straw while people poured white pasty rubber over his face. Was this a new kind of spa treatment? No. Some sort of torture? Not exactly, although Jonathan, 13, did say the experience made him a little anxious. The student let three Utah artists make a mold of his face for a glass sculpture to be installed at the newest Salt Lake City TRAX station, opening in September on 300 West between 800 and 900 South. "I was nervous that the straw would come off. It was kind of hard to breathe," said Jonathan, his black hair flecked with the white goop. "But I was OK. I was happy to do it." Jonathan was chosen for the project for two reasons: He attended Glendale Junior High, a school close to the $1.2 million TRAX station, and his Navajo-Ute heritage represents the neighborhood's diverse ethnic mix. The molding process took place at artist Dan Cummings' South Salt Lake studio, located, coincidentally, beside the north-south TRAX line. To capture a three-dimensional image of Jonathan's face, artists poured alginate - the material used for dental moldings - over his head to form a pliable mold. That mold will be filled with hot wax to create a more permanent mold, which ultimately will be taken to a kiln and filled with 1,600-degree liquid glass. The youngster's likeness will be one of 15 faces mounted on three 12-foot-high sculptures on the 900 South station platform by artists Cummings, Dinah Ihle and Kerry Transtrum. The artists also are designing four platform benches in the shape of clasping hands. "We wanted to tie it to the neighborhood," Transtrum said of the public-art installation. "That's why we're casting people from the neighborhood - because this is their station." Funded by the Salt Lake City Redevelopment Agency, the public art project is a partnership between the Utah Transit Authority and the Salt Lake City Arts Council to brighten TRAX platforms where riders wait for trains. Nineteen of the 23 TRAX stations, including every station in Salt Lake City, currently contain artwork. So, does Jonathan ride TRAX? Um, no, he doesn't. But that may change come September. "I'm excited to see how [the sculpture] looks," said the boy, who will be a freshman this fall at East High School. "It makes me feel proud that my face will be up there."